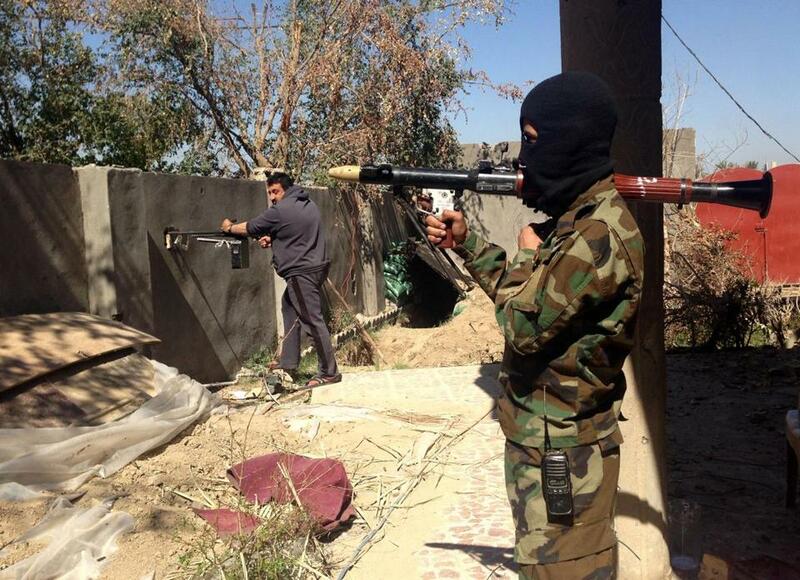 An Iraqi police officer held a position during clashes with jihadists in Ramadi as on Wednesday. BAGHDAD — Militant fighters of the Islamic State mounted one of their fiercest assaults in months Wednesday, setting off 21 car bombs in the city of Ramadi, even as the group lost ground in an Iraqi government offensive in Tikrit, security officials said. Security forces fought Islamic State holdouts in two remaining neighborhoods on the west side of Tikrit, the birthplace of Saddam Hussein, where militants massacred more than 1,000 Shi’ite Iraqi soldiers last year. The city has been the focus of a weeklong assault by Iraqi forces, the largest operation against the Islamic State since it swept into control of much of the country last year. Iraqi government troops and their Shi’ite militia allies appeared to be close to recapturing the city Wednesday and scoring a strategically and emotionally significant victory. As the pro-government forces continued to consolidate their hold on the area, they also uncovered two mass graves that were believed to hold the remains of some of the soldiers from Camp Speicher that had been killed by the Islamic State last summer. Security officials and militia leaders said that a total of 300 to 400 bodies were found in and near the village of Albu Ajeel, south of Tikrit. To the west, in Ramadi, the capital of Anbar province, the militants aimed to show that they could still inflict pain even as they lost ground in Tikrit. Hikmat Suleiman, the political adviser to the governor of Anbar, said that because of fortified defenses, growing battle experience, and improved intelligence, the Iraqi forces in Ramadi were able to keep casualties in the car bombings to a minimum by attacking and thwarting the vehicles as they approached, blowing up most of them before they reached their apparent targets. A senior military official at the Anbar province operations command said five people were killed in the bombings and scores were wounded. With so much attention focused on Tikrit, the fighting in Anbar has raged largely out of the spotlight, but it has been fierce. Two top commanders on the government side were killed as the security forces came close to retaking the town of Garma from militant con-trol. Iraqi leaders attending an annual forum in Sulaimaniya, in the semiautonomous Kurdistan region, followed the news of the battles with great interest Wednesday, declaring in speech after speech that the highest stakes and biggest challenges would come after the Islamic State was defeated in Tikrit and elsewhere and the time came to unify Iraq. Much rides on the outcome of the battles and what happens afterward. The bulk of the government forces are made up of Shi’ite militias, and there have been fears that they would engage in revenge attacks, as they have been accused of doing in Diyala province. Concerns about such attacks against Sunnis have been especially strong as the government forces began to make more rapid progress in Tikrit over the past two days. It was there that Islamic State forces swept over Camp Speicher last summer, staging mass killings of Shi’ites and posting some of the scenes on social media. On Wednesday, as the remains of hundreds of those killed in that massacre were uncovered, the spokesman for one of the main Shi’ite militias that had taken the area, Asa’ab Ahl al-Haq, said that health officials had been notified and were to remove the remains soon. The spokesman, Naim al-Aboudi, said photographs of the sites and remains had already been sent to Baghdad’s central morgue. “I’m calling all those who lost their boys in this mass grave to go to the morgue and see if they can identify them from their clothes or their faces,” he said. He said Sunni residents of the village had led militiamen and security forces to the mass graves, and some said that they had seen young men brought from Speicher later buried there. “This battle today has proved to the world that the Sunnis and Shia are united,” he said. Some Sunni residents in areas held by the Islamic State have said that they would welcome the Shi’ite militias if they rid them of the militants’ harsh rule. At least 4,000 Sunni tribal fighters have taken part in the battle for Tikrit on the government side, and another 4,000 have been mobilized in Anbar, according to security and provincial officials. In Anbar, Shi’ite militias have only a minimal presence, according to Suleiman, the political adviser. He said most of the fighting there was being carried out by the official Iraqi armed forces and local fighters.